Happy Tuesday, all! 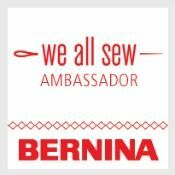 I know lots of you have seen posts by others on the Around the World blog hop lately, and I was lucky enough to be tagged to participate by two bloggers- Jess at Quilty Habit, and Carole at From My Carolina Home! ps- since they tagged me on different days (Jess last Monday and Carole yesterday), I'm not posting exactly on the "correct" timetable. There are a few guiding questions for those who participate, so I guess I'll get right to it! Actually, I've finished up a couple of big things over the holiday weekend! First, I finished up my Stacked Squares quilt and decided to call it Framed since the blocks look like picture frames to me. 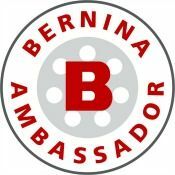 It's exciting to have the opportunity to share it in this post! In case you missed my last post on this quilt, I modified the original pattern to use fat quarters or quarter yards, rather than precuts. I love precuts, but I don't always have them on hand. Check out my modifications (including cutting diagrams) HERE! I decided to piece the backing with all of the scraps on hand, along with some wide stripes, and I like the way it turned out! The 3D effect of the stacked blocks is so much fun, and I really had a great time making this one! 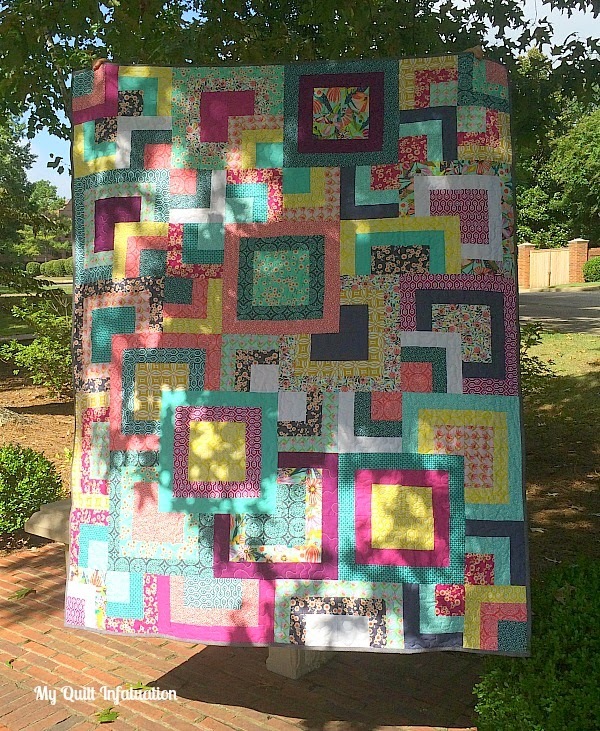 The other big thing that I finished up this weekend is my third quilt pattern! I wrote the pattern for my Slingshot quilt in three sizes (lap, twin, and queen), so it took plenty of time (and math). Check it out in my Etsy or Craftsy shop! That's a tough question because I don't necessarily think all of my quilts fit into a specific genre. 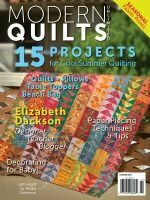 Modern quilting has such a wide range of fabrics and pattern styles, and I've made quilts spanning that range. It's hard to put a label on it. 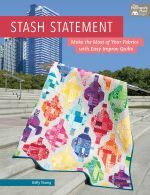 I guess I gravitate toward fresh twists on classic styles, and I love bold, modern fabrics, and I LOVE quilts with tons of fabric variety. I will often use more prints than necessary so that there is lots of variety in the quilt (then I just use the rest in the backing). 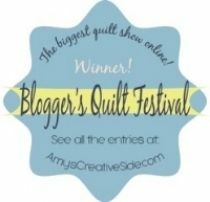 I blog and quilt because I just love the whole creative process, and I love being able to share it with such a vibrant online community. I'm a teacher, which is not exactly a low stress career, and all of the lesson planning, grading, deadlines, and worry about students can easily consume one's thoughts at all hours of the day and night (not a good thing!). 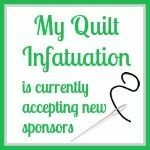 Quilting gives my mind something active to do that is positive and fulfilling, and blogging is really just an extension of that. By occupying my "down time" with quilting, I am actually more productive! 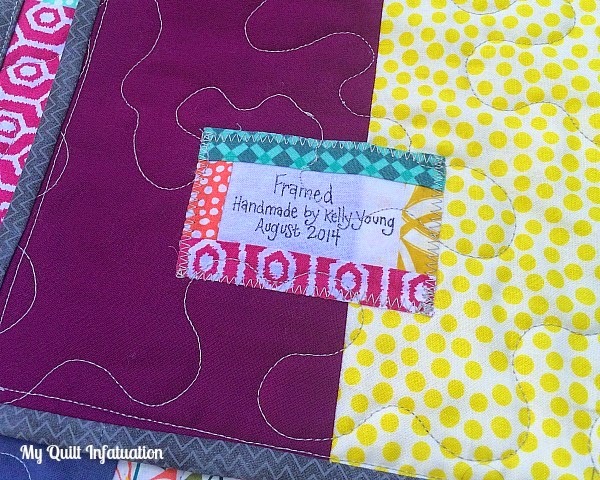 I have always loved to write, so blogging combines my love of writing, teaching, and quilting! My creative process varies from quilt to quilt. Sometimes, a bundle of fabric will inspire me, and I just have to find the right pattern to show it off. 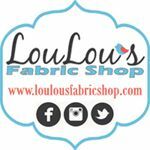 Other times, the pattern comes first, and I purchase fabrics specifically for the project. Regardless of the way my quilt ideas start, I always plan everything out before I make the first cut, and if I'm buying fabric for a specific pattern, I plan it out before I even purchase anything! Unless I'm using a written pattern (which is rare), I sketch on graph paper or play around on the Threadbias Design tool to be sure I don't waste any fabric! With rare exceptions, I am a one-project girl. I plan, cut, create, photograph, and blog one quilt before starting another. The biggest exception to this rule is when I have a "eureka" moment and come up with a new quilt design in my head. Then I sketch it out before I lose it, even if I'm in the middle of working on another quilt. 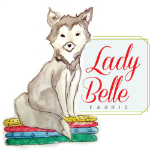 I'm so excited that I got to participate in the Around the World blog hop. As part of the fun, I get to tag three bloggers who inspire me. 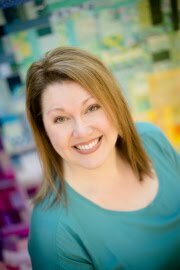 I'm tagging Janet from Simply Pieced, Maryse from Maryse Makes Things, and Hilary from Young Texan Mama. Be on the lookout next week for their posts! Congratulations on getting Slingshot written up Kelly! Framed looks wonderful - love how you did the back too! It is really interesting to read your answers - I really like what you wrote about why you write and create. I bet a lot of us have much the same reasons! I love the front, but now I love the back, too! 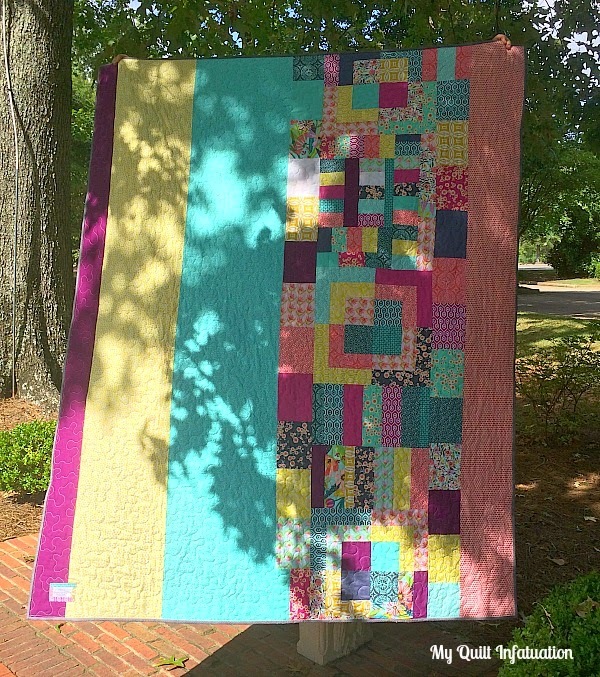 If I had this quilt, I'd have to flip it everyday, so that I could enjoy both sides! You have been so busy! 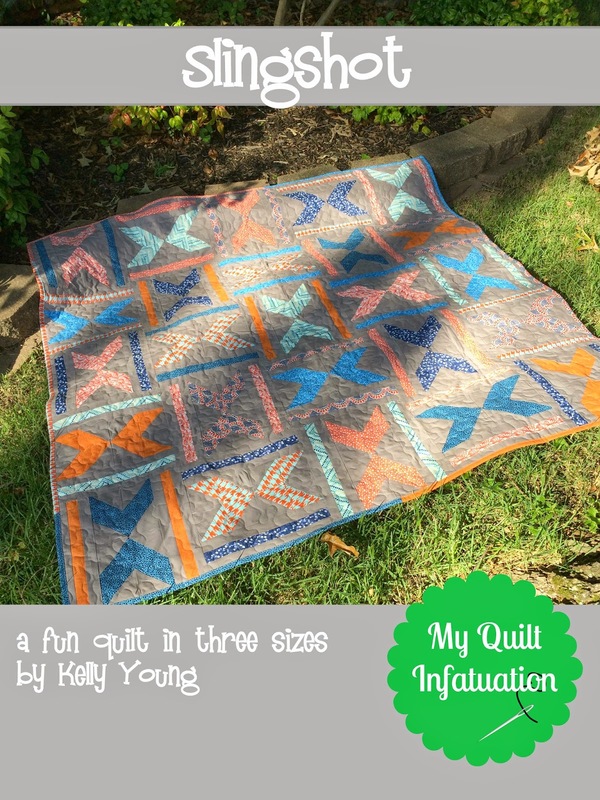 Congrats on a beautiful pattern and new quilt! The scrappiness is lovely. I enjoyed reading about your process! I really like how your version of Stacked Squares turned out. I usually do not have many layer cakes or other precuts in my stash. This inspires me to cut into my favorite fat quarter stacks. Your new Slingshot pattern is so fun. 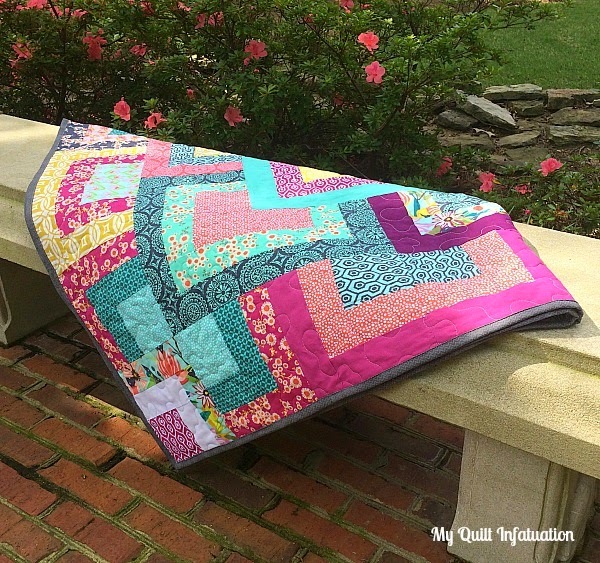 Both your quilts are very different, and both turned out great! Congratulations on finishing your pattern too. 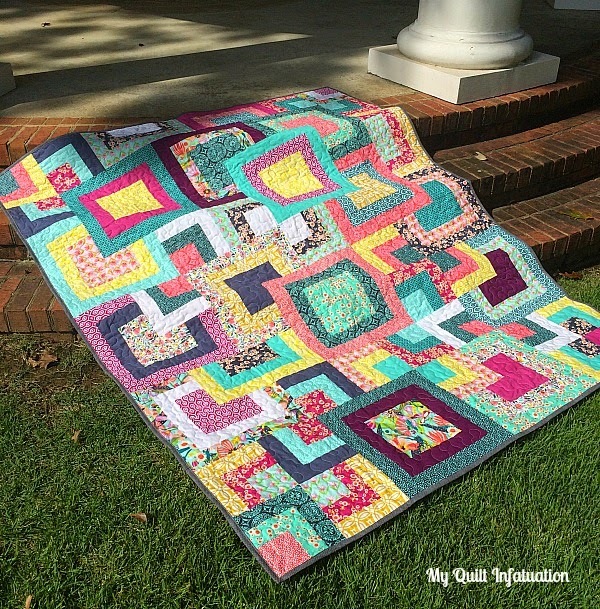 Wow, that's a stunningly pretty quilt !~! I love it, Kelly. The colors sing to me and the back is just as neat as the front. Congrats on a gorgeous finish.